Rotherham-based United Carpets, the second largest chain of specialist retail carpet and floor covering stores in the UK, has reported an increase in profit before tax of 18.1% against the comparable six month period last year. In August 2012, the Bramley-based, AIM-listed company had its shares temporarily suspended after admitting it would not be able to publish its full-year results on time. In October 2012, a pre-pack administration deal saw United Carpets Group acquire the business and assets of its trading subsidiary United Carpets (Northern) Limited. The restructuring, which saw a number of under-performing stores and franchises close, helped to improve profit margins and reduce distribution costs and administrative expenses including rent, rates and staff costs. Like-for-like sales increased by 0.3% in the six months to the end of September but network sales fell to £25.6m from £28m and revenue dropped to £9.1m from £10.3m a year ago. This meant that pre-tax profit rose 18.1% to £534,000. Today, the network of stores totals 60, down from more than 80 stores just over two years ago, of which 48 are franchised and 12 are run as corporate stores. The group said that the changes to the portfolio of stores resulted in a stronger core network which is reflected in the current trading performance. Leases have been re-negotiated for nearly all of the stores and the cost base has been reduced. The group added that there may be a small number of store closures in the future but six concept stores have also opened in smaller units on the traditional High Street, working well with the store network. 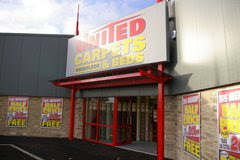 Paul Eyre, chief executive of United Carpets, said: "I am pleased to be able to report a good performance by the Group. We have been helped, to some extent, by an improving housing market with slightly higher average transaction values which we believe reflects an improvement in consumer confidence. More recent like for like sales figures have been more positive and I believe we are well placed to deliver a good result for the year. "We continue to benefit from our restructuring programme as we operate from a lower cost base giving the opportunity to invest in developing the business and providing the basis for the Board's confidence in the future."